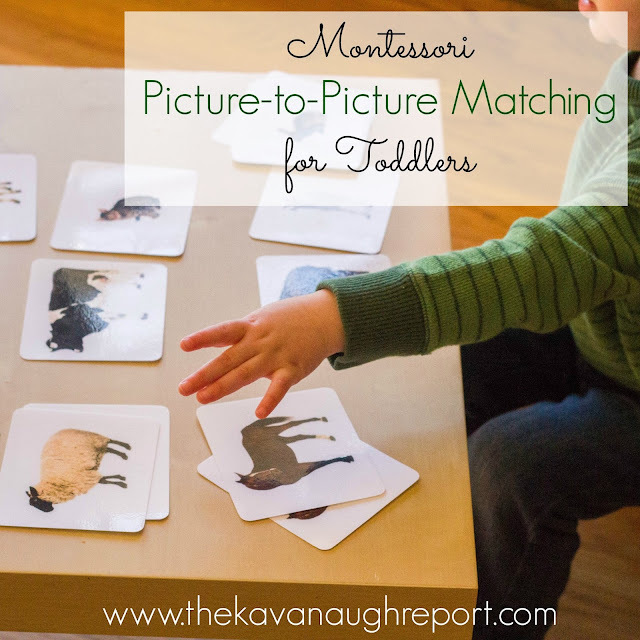 Picture-to-picture matching for Montessori toddlers is the last big category in the series of matching work for toddlers. I've noticed that this type of matching is what a lot of people try to jump to right away with toddlers. 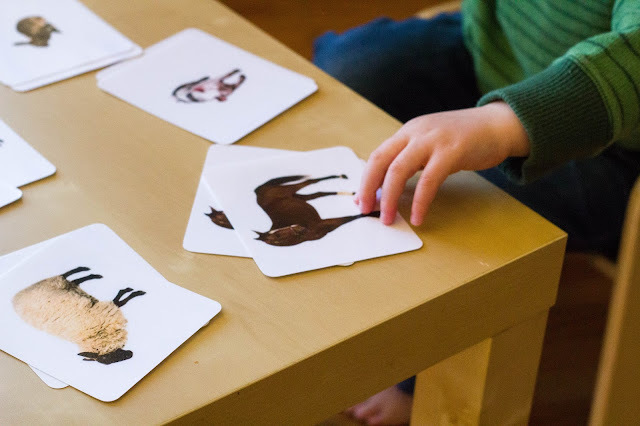 For that reason, it's pretty easy to find cards that can be used for this type of matching work all over the internet. It's also attractive because it doesn't require any objects, only matching cards. But, just because it is easy to prepare doesn't mean young toddlers are ready for this. 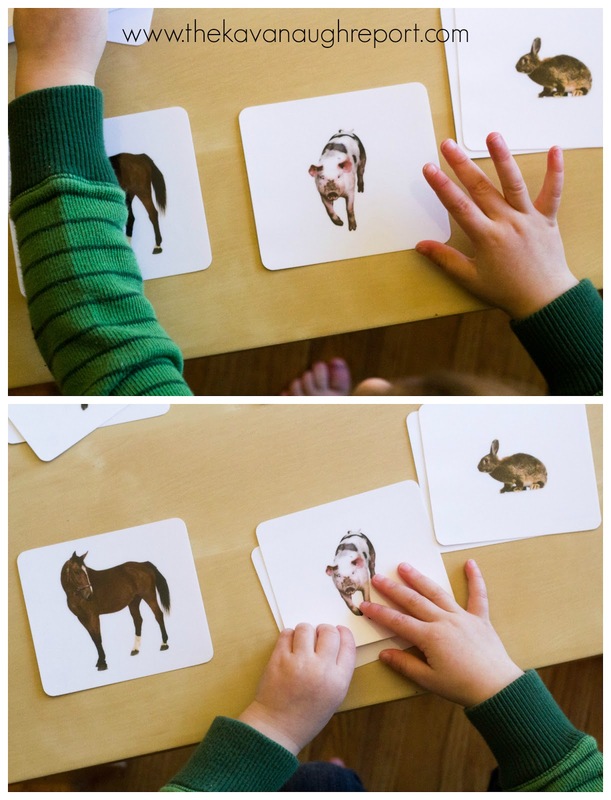 Like the other types of matching this work, this is a pre-reading skill that toddlers need. 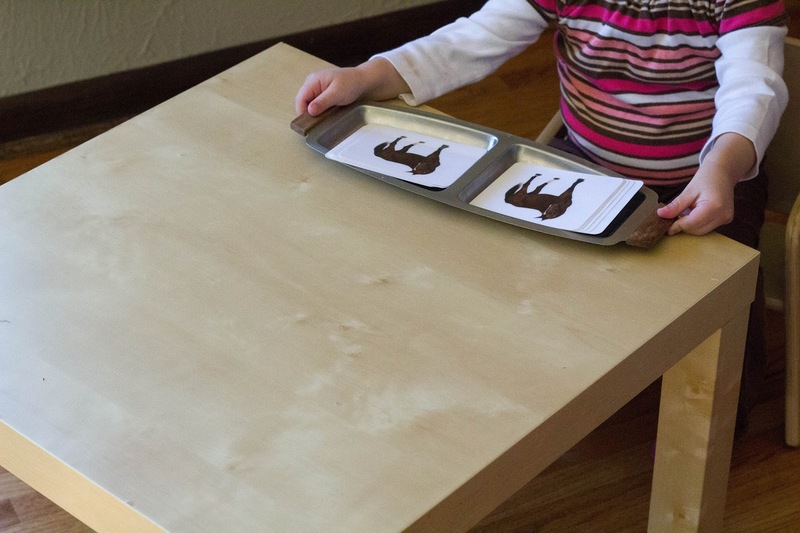 It helps toddlers learn to visually discriminate between objects, this time in a completely abstract way. There is no way to touch and feel the difference like with the other types of matching. This must be done entirely by sight. And, this really isn't an easy skill, if the child isn't ready and hasn't had the proper foundation. Nora (at 21 months) is not ready for this type of work. At all. I don't rush her nor do I feel any real need for her to be doing this type of work at this point. So, in these pictures, I've used some older toddlers, from my co-op. 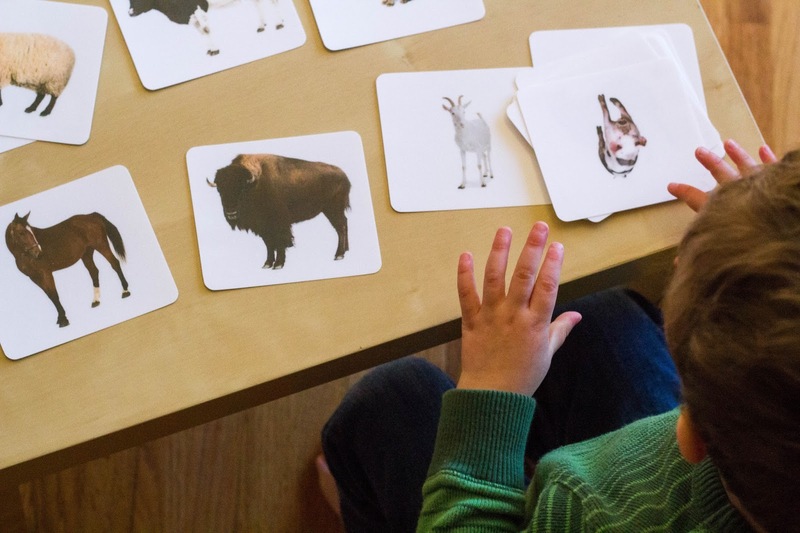 This guy is 33 months, and happily and successfully completed this work on his own -- repeating it several times. To present this work, I simply have a set of identical cards in a divided tray. 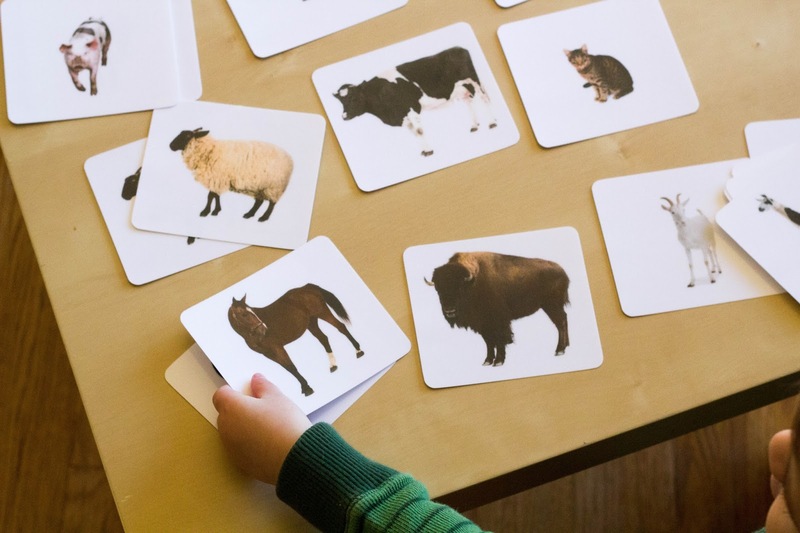 These particular cards are from Michael Olaf, but any simple flash cards or images will work. I try to use images without text but that's not always possible. I start by laying one set out and then grabbing one of the pictures from the other pile. Moving left to right, I slowly place the card next to the cards that are placed on the table until I find the match. I repeat until all the matches are gone. Then, the toddler repeats. 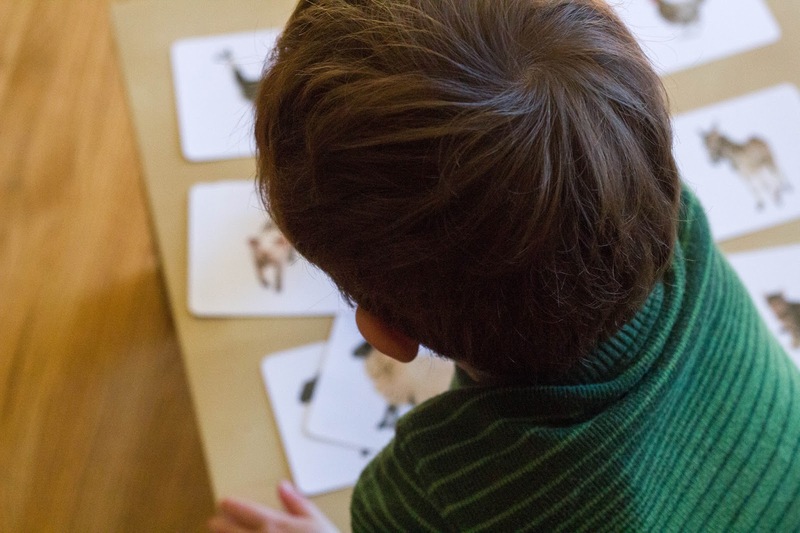 The toddler may move just how you did, or they may find their own groove. I let the exploration happen! 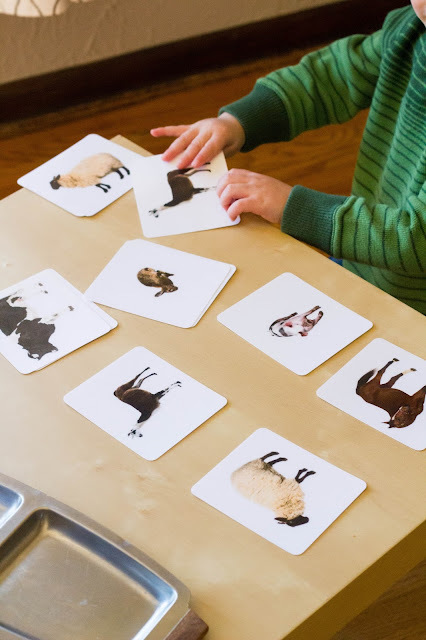 Try not to direct the matching by naming the objects or pictures. As always, its process over product. Once toddlers have mastered picture-to-picture matching, there are so many great extensions that can be done with this work. You can use one image cut in half to match, you can match an image to its silhouette, invert colors, or play memory. All of these are great ways to increase those abstract visualization skills that are so important for reading one day! I hope you enjoyed this series on toddler matching and have a better idea about the order that matching work can be presented in. This is something that you can truly customize to your child's interests and can easily be put together! 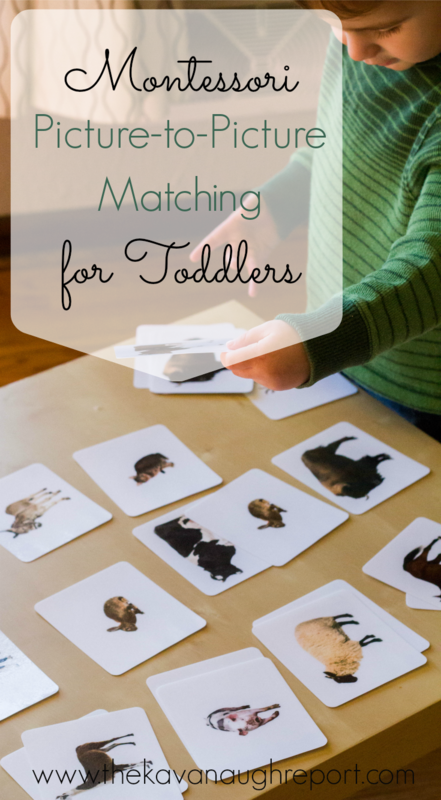 What type of matching does your child enjoy? Have you tried picture-to-picture matching? Painting is not constrained to your dividers. What about painting picture edges and making them your own. You can paint them any shading utilizing for all intents and purposes each sketch method. Painting picture edges is quick, fun and an awesome approach to make custom craftsmanship in your home. Inside of minutes you have your completed creation. This is a decent approach to test another shading or method without spending a great deal of cash or time.